Pony E-News: Community scholarships, celebrating our retirees and more! More than seven hundred thousand dollars in scholarships were awarded to Stillwater Area High School seniors. 72 local donors offered 140 scholarships to SAHS students. This year, 97 graduates were given awards totaling $700,384 in first-year and renewable scholarships (including national scholarships.) That does not include scholarships given from individual colleges and universities. Thank you to all of the local community groups and individuals who have invested in our graduates and supported their continuing education! View the recipients on our website. 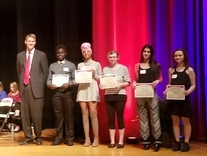 Top students from the Class of 2019 were honored at Stillwater Area High School's annual Book Awards Ceremony. Seven juniors were recognized by leading colleges and universities for their academic achievements and community involvement. Congrats to Abigail Banks-Hehenberger (Brandeis University), Lily Mayek (Dartmouth College), Maxwell Stauffer (George Washington University) John Maloney, IV ( Harvard University) Sydney Nelson and Thomas Meyer (Saint Michael’s College) and Ian Ruh (Yale University). 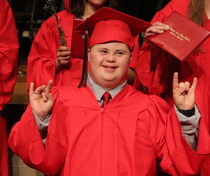 Ten students from the Class of 2018 graduated from the SAHS Special Education program. The students were honored at a ceremony which was attended by family, friends and fellow students. After the SAHS orchestra played “Pomp and Circumstance,” each student was called up on stage and recognized for their accomplishments. Many students love the experience of a smaller, personalized ceremony. Others also enjoy participating in the larger graduation ceremony at Roy Wilkins Auditorium. For photos visit our Facebook page. The preschool Class of 2018 is ready for kindergarten! 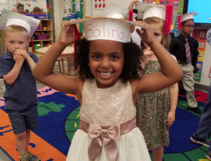 About 275 students graduated from the district’s eight preschools this week. This is the first year preschool was available at all of our elementary locations along with the Early Childhood Family Center. These little learners will become the high school Class of 2031 this fall. Photos on Facebook. The Stillwater Choir proved they know the meaning of “the show must go on” after pushing through a power outage to perform their annual Pops concert. As storms rolled through Thursday evening, the power went out just three minutes before showtime. With a sold-out crowd of 500 people waiting and only generators keeping the emergency lights on, about 200 students did what any good live performer would do - they improvised. Watch the video. This year our Pony family will say goodbye to 27 long-time employees. They were honored at a retirement banquet at the Lake Elmo Inn Event Center. This group of retirees has more than 550 combined years of service to the students and families of our district. We wish them the best in their retirement and thank them for their dedicated service to our school community. Visit our Facebook page for the list of names along with heartfelt comments from students and parents. Stillwater Area High School teacher Debbie Drommerhausen has been named a Teacher of Excellence by BestPrep. The award recognizes the top 2% of educators who go above and beyond in their commitment to educating Minnesota youth. 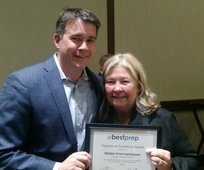 Mrs. Drommerhausen has been actively involved with BestPrep’s Stock Market Game, Classroom Plus, and Financial Matters programs for 25 years. Her marketing students have a long history of success in The Stock Market Game, this year placing first, second and third in the investment competition.